Your relationship with coffee has developed over time. You have taken things slowly- nice and steady. First there was the coffee machine or perhaps it was a moka pot? Suddenly, you realised what great coffee could taste like. next you bought yourself a handheld milk frother. But you’ve come to another “coffee” crossroads in your life. Not satisfied with merely frothing, you want to create some latte art. For a simple piece of kit, there are a bewildering range of products to choose from! After all, it is just a metal jug isn’t it? Not if you want to take your latte art seriously it isn’t. And to help, I have created a milk frothing jug buying guide. The buying guide explains the 8 killer features that any self respecting frothing jug needs..
…no matter how experienced you are. So let’s take a look at the first feature. Are you a social coffee drinker, work in a coffee shop or do you tend to drink coffee solo? The first thing to think about is how much milk do you need to froth? A milk jug is at its best when it is half to two thirds full. In other words, when there is room in the jug for the milk to expand but not so much room that your steam wand or handheld frother is struggling to reach the milk. These jugs come in two standard sizes- 12 oz or 20 oz. I mean, other sizes are available (and one of my recommendations below is a whooping 66 oz) but these two sizes are the biggest sellers, by far. Using a fairly standard calculation, a 12 oz jug at a push could provide enough milk for two cups of cappuccino. Once you have decided on what capacity of milk jug to buy, the next feature to consider is shape. The milk creates a whirlpool effect which helps to make sure that the all the milk is heated consistently and that the bubbles are distributed evenly. If the jug is too narrow, this whirlpool can’t happen as with a wand or frother in the jug, there simply is not enough room for the milk to move. Look for a jug with a conical shape- a wide base going to a thinner neck. This shape will also help to keep the heat in because there is less room for it to escape out of the top. Having decided on the size of your milk frothing jug and its shape, it is time to start thinking about the next crucial feature. A foundation of a perfect latte or cappuccino is that the balance between the amount of milk and espresso is just so. And in order to achieve that level of accuracy, your jug needs to include a measurement scale- at least on the inside but preferably on the inside and outside as well. And this scale needs to display milliliters and ounces. 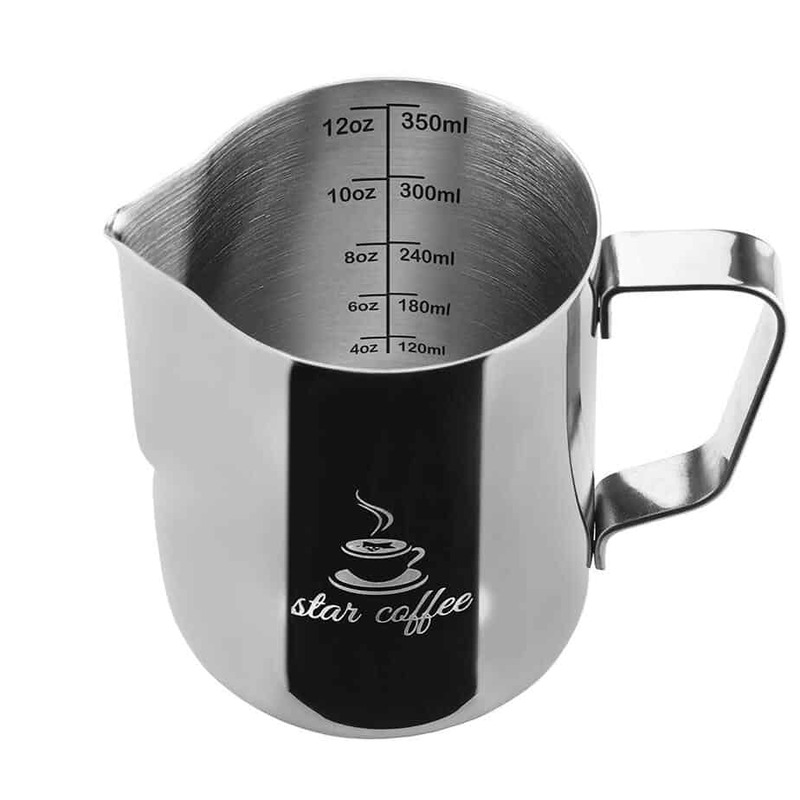 Having made sure that your jug will help your measure the amount of milk that you use very accurately..
..the next killer feature to look for in your barista milk jug is what it is made out of. 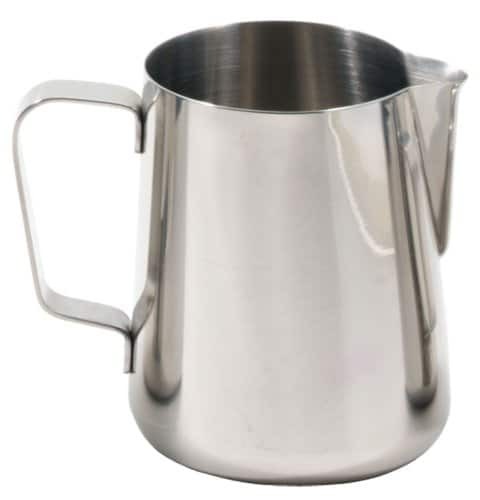 Like many items in your kitchen , you want a milk frothing jug that is made from food grade stainless steel. Food grade stainless steel is a certain type of stainless steel that is robust enough to survive repeatedly being heated and washed in water. It must not have any surfaces on it that could allow bacteria to grow and it must be rust and corrosion resistant. The most common type of food grade stainless steel is normally identified by the number 304 or as 18/8 or 18/10. The first number (18) refers to the percentage of chromium in the product whilst the second number (8 or 10) refers to the percentage of nickel that it contains. 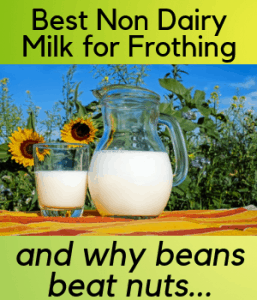 Because a milk frothing jug is metal, it helps to maintain the temperature of the milk that you are frothing which is vital to the frothing process. But it also means that the jug itself will become hot and might be uncomfortable to hold. Because even though many milk jugs have handles, whilst the milk is being frothed you want the jug to be sitting in the palm of your hand. Some milk jugs have a spout that is shorter and rounder in shape whilst other jugs have slightly narrower spouts, with a more pointed end. The two classic patterns in latte art, are the heart shape or the rosetta (or fern) shape. For beginners, it is easier to create these shapes using a spout which has a more rounded shape. 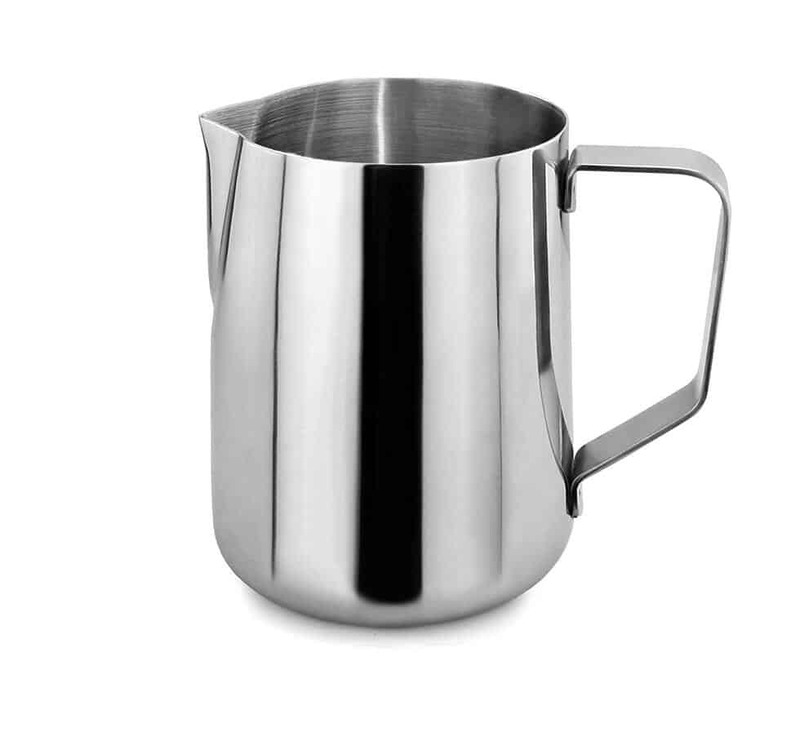 To look at, most milk pitching jugs are quite bland- just plain stainless steel jugs. And for most people this will be fine. After all, it is not about how the jug looks but it is about how it performs. Are you able to create a fabulous foam and a perfectly shaped fern?! But for a few of us, we need more. As well as playing the part, we want our jug to the look the part. To be the bees knees. To look as stylish as the coffee that we are creating. 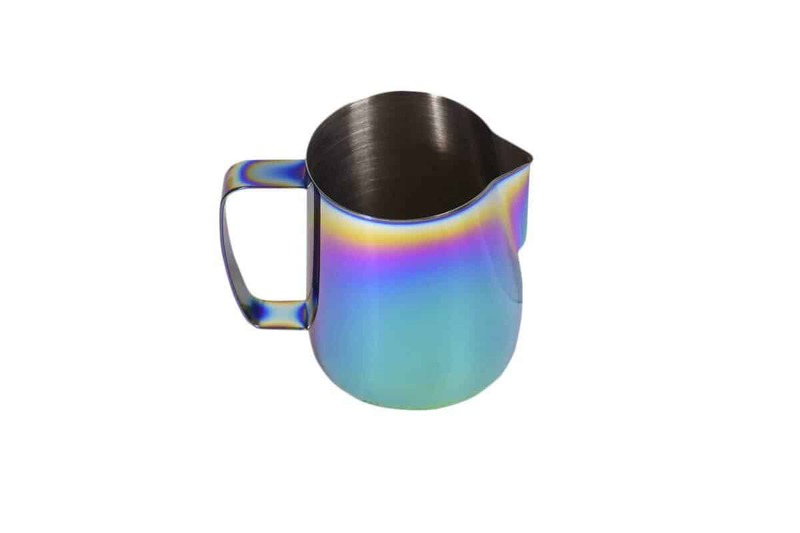 And for those of you who want this, you need a milk frothing jug with a titanium finish. It seems that every product available to buy nowadays is getting smarter. They are having features added to them to make our lives easier. One of the trends in milk jugs, is for them to have a color coded temperature scale on the outside. This means that at a glance you can tell if your milk is at the right temperature. And now let’s discuss our final killer feature for your barista jug, which is the warranty. I shall keep this description short and sweet because it is plain and simple. 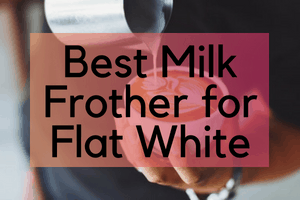 Spend the most money that you can afford to get the best milk jug for you. And make sure that it has a great warranty. After all this is an item that you will use very frequently and you need to know that in the event of anything going wrong with it that you will be sent a replacement, hassle free. Best milk jug for the tentative newbie home barista! 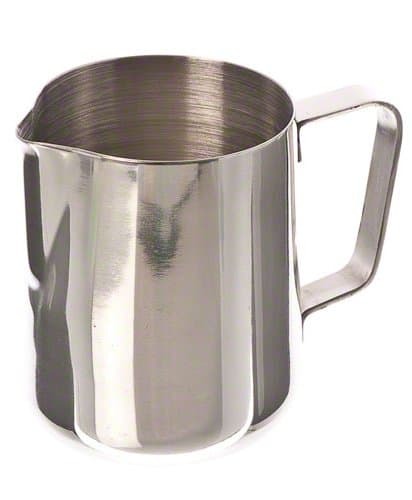 For those with a tight budget, the Update International 12 Oz Stainless Steel Frothing Pitcher is a great option. When it comes out of the packet, it’s much smaller than expected. The perfect size for making a 12-16 Oz coffee. But it won’t quite be enough for your giant mug of latte in the morning. It’s not big enough to dish out a bunch of coffees when entertaining either. After a few days use, the stainless-steel coating does scratch a little too. 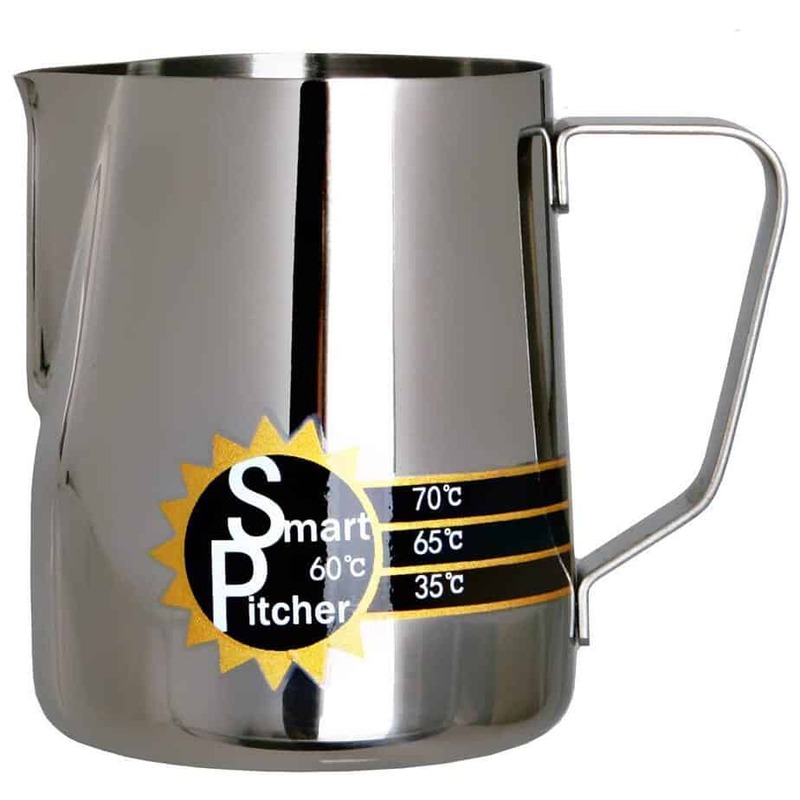 It suggests the pitcher has a chrome coating rather than true stainless steel. And some users report that it does sometimes leave a tinny taste in the milk. For the price, however, it’s a great piece of kit. Good for someone who is wants to try creating some latte art for the first time. Want to make coffee like a professional barista? Then it’s worth giving one of Star Coffee’s excellent pitchers a go. The pitcher comes in three different sizes. The 12 oz is perfect for a single. The 20 is great for sharing a romantic coffee. The 32 is amazing if you plan to entertain. The measure on the inside is clear and easy to use. The jug feels solid and well-constructed. It makes you feel like a professional. It’s top-notch quality for the price. The measurement bars on the inside are perfect too. You can whisk away knowing you’ve measured the right amount. Star Coffee are a great company with a reliable product. [3.] 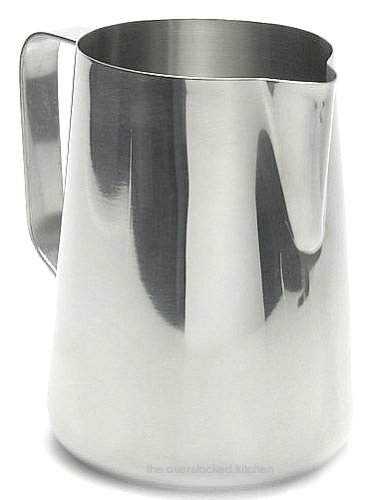 X-Chef Frothing Pitcher Stainless Steel Milk Pitcher 12 oz. Do you want something high-class at a low budget? 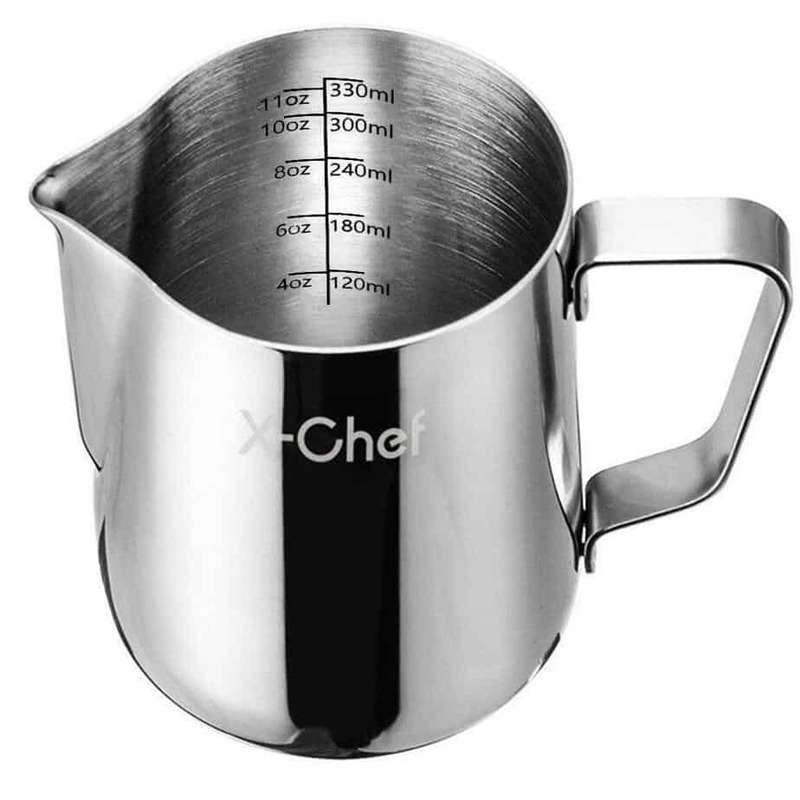 The X-chef Frothing Pitcher is a sturdy, beautifully polished piece of kit. It’s got excellent measurement bars on the inside too. It’s a touch on the small side at 12 oz. But it’s perfect for someone who wants to treat themselves to morning mocha or cappuccino. It’s also super easy to clean. Most froth comes off in a rinse. As you clean it you can feel the quality of the stainless steel. It’s the ideal starting pitcher for a newbie barista. You can feel the quality of the workmanship just by holding it. It is a real shame that I couldn’t find any sensible dimensions for this cup. It is clearly not 12″ tall and 12″ wide! The Skyline Milk Frothing Pitcher is stylish. It looks and feels great to use. It’s made of top-grade stainless steel. It comes in two different sizes, 14 and 20 oz. So, it’s both handy for a quick cup with breakfast or a gathering with friends. The sides are splash resistant. You won’t get froth everywhere. With its excellent pouring lip, you can decant the milk out from under the foam. The only slight issue with the design is the handle, it just doesn’t feel solid and secure like the rest of the pitcher. Otherwise, an excellent pitcher. It’s durable and makes a great latte! 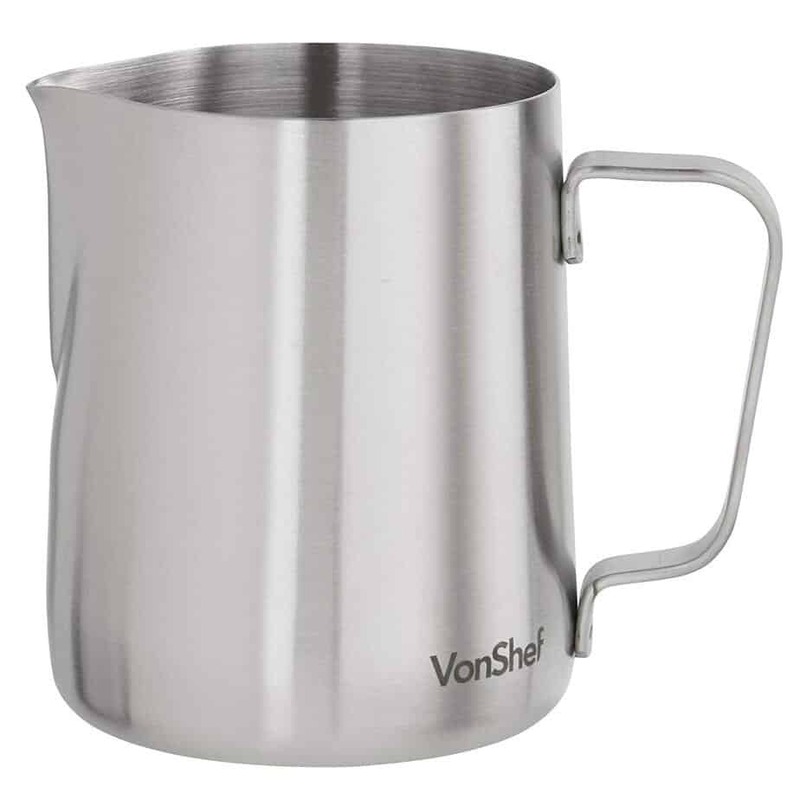 The VonShef Milk Frothing Pitcher Jug is a wonderful bargain. It comes in three sizes, 12, 20 and 32 oz. The size depends on how much cups you want to make. It’s also great for making hot chocolate. Even the smaller size can do enough milk for a couple of lattes. Just add some milk, drop in your immersion blender, and you’ll have a delicious layer of froth in moments. Its handle is solid and it cleans up a dream. The pitcher is a bit lighter than others. It feels like aluminium rather than stainless steel. But it works great and is well worth the price. Want something a bit high-tech? The Smart Pitcher might be what you’re looking for. It comes with a built-in thermometer. You can heat your milk to the perfect temperature before frothing. No more worrying about over-steaming the milk! The thermometer is extremely durable, even after repeated use. It changes colour as the temperature rises. It makes life easier both for the professional barista and the amateur enthusiast. It’s probably not a good idea to put it in the dishwasher though, it might ruin the temperature gauge. It cleans up easily by hand, and its durable design will last you a long time. 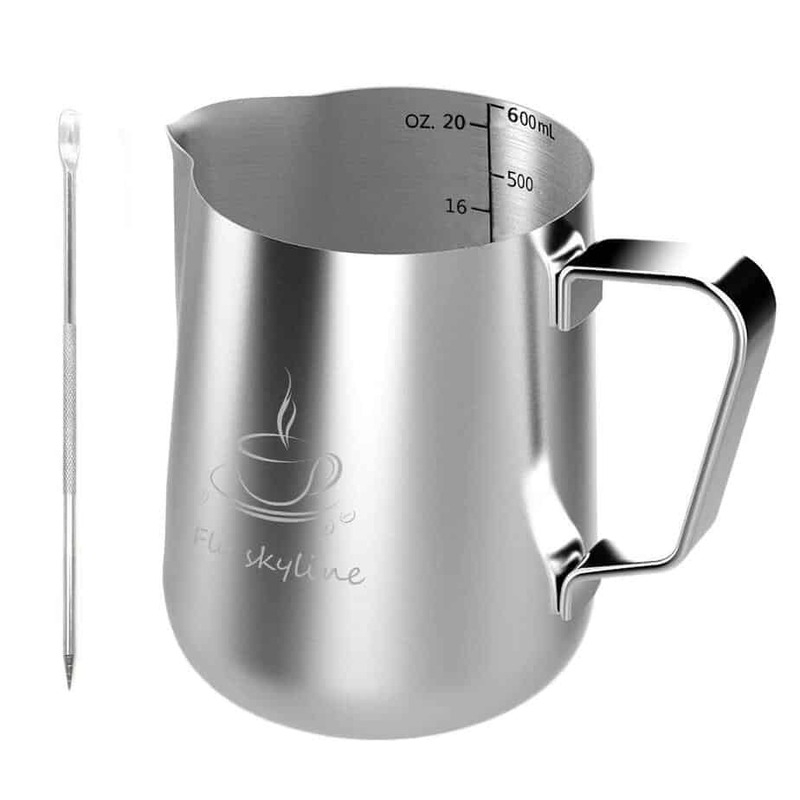 Consider the Rattleware 20-ounce Latte Art Milk Frothing Pitcher. It’s built for commercial use but is also aimed at the discerning home user. It looks and feels solid. Its weight makes it feel well-made and tough. It’s got an excellent tapered spout that is perfect for creating frothy art in your coffees. Great if you want to show to friends, family or even customers. The only thing that would make it better would be a measuring gauge on the inside of the jug. If you want something strong and reliable, this is your pitcher. It’s size and shape are perfect. For something sturdy, try the New Star Foodservice Commercial Grade Pitcher. It’s a big hunk of solid steel and it feels like it. It’s got a satisfying weight and it is very sturdy. It can withstand the occasional drop or being accidentally hit. It’s great value for money too. And it also comes with a free espresso tamper that’s also of excellent quality. It’s the ideal compromise between price and workmanship. It pours well and it’s the perfect shape for avoiding too much splash. If you’re looking for something durable and functional, this is your pitcher. Are you a bit of an obsessive barista, who wants nothing but the best? This jug has been engineered to produce the best milk froth and latte art. It’s extra wide handle has been designed to keep the jug perfectly balanced whilst pouring. The spout has a unique sharp “v shaped” design which allows for the most intricate patterns to be created. And the jug itself is a work of art. All of these special features do come at a premium price. But, if you know you future is “latte art”, you won’t mind that one bit. Haven’t found a pitcher big enough for your needs? Take a look at the New Large 66 oz Pitcher from Update International. At a whopping 66 oz, there are few that match it for capacity. It’s perfect for whipping up a batch of cappuccinos for that dinner party! It’s very affordable too for. And it’s so big it can be used for many other purposes beyond frothing up a few pints of milk. Even for making soap too! However, it’s not the most elegant pitcher out there. The pouring spout is a little to shallow for making latte art. But, for its size, it’s great value for money.